May 30, 2016 - Like us now! LUMS Center for Entrepreneurship (LCE), LUMS’ flagship experiential development platform for entrepreneurs held an exclusive investor event to mark the graduation of its fourth cohort of nine startups graduating from The Foundation incubator. 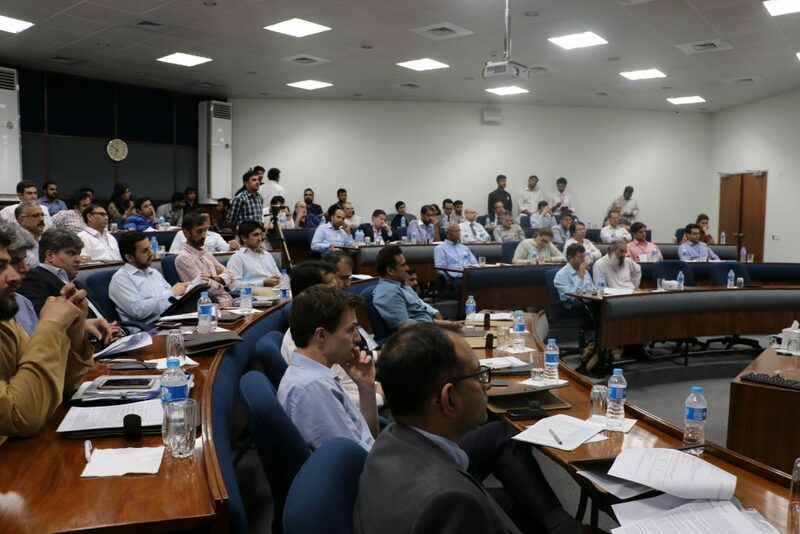 The Foundation Investors Summit, held at the Rausing Executive Development Center in LUMS, was the third event of its kind organized by LUMS Center for Entrepreneurship. The audience comprised of both local and international investors and business tycoons including Razzak Dawood of Descon, Humayun Mazhar of CresVentures, Omar Saeed of Service Industries, and over 60 other high net worth angel investors. Startups that pitched at the Investors Summit included Fictive Lab, an IoT company focused on solving problems through innovative, smart and connected devices; NearPeer, a portal providing online tailor made courses to college and university students; Shahi Sawari, a 24/7 on-demand rickshaw hailing service; ShadiBox, an online platform connecting customers to wedding vendors and help them search, review, compare and book appointments at the cheapest rates possible; Dockit, a discount card offering discounts on every consumer sector including food, apparel and recreation; Paperpk.com, one of Pakistan’s biggest job/career advertisement website; Treble, a mix of Spotify and Instagram of crowd-sourced music videos; Mezaaj, a business platform for upcoming fashion and textile designers and last but not the least, Sabzi.pk, a startup providing home delivery of fresh fruit and vegetable at highly competitive rates. The Investors Summit opened with a welcome note from the Vice Chancellor of LUMS, Dr. Sohail Naqvi. It was then followed by an introduction of LCE by the Executive Director, Khurram Zafar, who said that out of the 46 startup graduates of LCE, 42 are operating, 2 have exited and 2 have shut down. 10 startups have already raised approximately PKR 130M valued at over PKR 800M. The startups have already generated over PKR150M in revenue and crated over 400 direct jobs. The keynote address at the event was given by Chairman PTA, Dr. Ismail Shah who outlined the various incentive programs for startups being offered by ICTRDF including funding for research commercialization and startup mobilization. Yusuf Hussain, MD of Dual Matrix Ventures gave a run-down on angel investing in Pakistan. After the startup pitches, guests were escorted to dinner which was accompanied by deep dive sessions and networking. LUMS Center for Entrepreneurship is currently incubating 12 startups as a part of its fifth cohort.